Helen would rather be ice skating or playing basketball or simply going to school with other 10-year-olds. Yes, she wants to go to school. Desperately. But she can't. She doesn't dare. Helen Reid often finds herself in a "little black room" that she 'can't get out of." Attending school - and being around normally benign smells and substances - would only make her condition worse. "Everything goes black, and I shake. Sometimes I fall," the blue-eyed tyke slowly explains, her brown-haired pony tail bobbing in rhythm. "Sometimes I fall. I get scared if nobody's with me." Helen is believed to be a victim of pesticide poisoning, which probably sounds a little more rural than it is. Helen's parents and some doctors believe scabies or lice ointment or both, are the reason her life is now a nightmare that includes daily seizures. She has suffered severe fatigue, breathing problems and occasional blindness. She has been in and out of a wheelchair, and once her right leg shook for 34 days without stopping. She cannot eat beef and is sensitive to chocolate, peanuts, baker's yeast and a growing list of other foods. It all dates back to the fall of 1994, when Helen was diagnosed as having scabies, a parasitic disease. Dermatologists told Helen's parents to apply scabies ointment liberally, including head-to-foot applications. That meant the 40-pound Helen was exposed to 150 percent of the maximum dosage for a full-grown adult. It also apparently meant overdoses of noxious elements seeped into her nervous system. 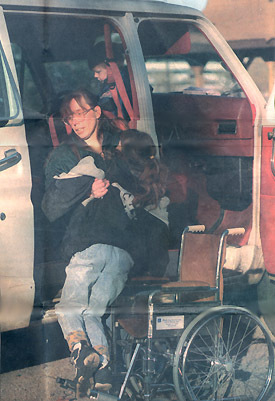 "She was perfectly normal until Nov. 21 (1994)," said her mother, Peggy Reid. "Later, she was discharged from Children's Memorial Hospital after having 20 to 30 seizures a day. They said it was psychological. Up until March, no doctor would treat her." Then the Reids were referred to Dr. Terrence Haws at the Randolph Clinic in Arlington Heights Illinois by the National Coalition Against the Misuse of Pesticides. This kid was fine until November (1994)," Haws said of the nearly straight-A student. "Her problem now is chronic and it defies placing this child into a medical model which conveniently can explain her condition. We think she needs more inclusive therapy that I can't provide here. She needs medically supervised deep-heat therapy, like a sauna, to detoxify." Peggy, above, waits for the results of Helen's allergy testing session in Arlington Heights. Even though Helen, left, experiences occasional paralysis, she likes to play in the park, have snowball fights and go to McDonald's. Before Helen can sweat it out at an alternative medicine center in Dallas, however, she and her parents, Peggy and Bill, first must sweat out making ends meet. Helen is the middle of seven children ranging in age from 2 to 18. Despite a chronic limp, Peggy waitresses third shift at the Star Lite Restaurant in Zion Illinois, 'Me busy working mother also serves on the school board at Our Lady of Humility Church in Beach Park. Bill doubles as a janitor at the Great Lakes Naval Training Center during the day and a pizza deliverer at night. On their budget, they have little hope of eking out the $20,000 needed for the Dallas treatment. The Reids' HMO will not pay for it, even though an insurer as basic as Medicare would authorize at least some of the treatments, Haws said. "She's in limbo," he said exasperatedly. Helen takes about 10 pills a day - including vitamin C, magnesium, potassium and amino acids - to stabilize her muscles and replace nutrients Haws says are "leaking" out of her cells. She also injects herself twice every four days with antigens, which are similar to allergy shots, according to her mother. Haws constantly finds new things Helen can't tolerate, including varnishes, deodorants and some soaps. Often, she and her parents find out the hard way at home. A new coat of paint at a friend's house or the wrong backing on a carpet unknowingly can cripple Helen, a fact often learned only after she rolls her eyes back in her head during a few seizures. "It's like we're constantly playing detective," said her mother, an investigative type who has kept a diary. As a result, the Reids' house has come to look like a mini war zone, with carpeting torn off floors that are littered with toys and stuffed animals. "They're willing to do anything for their kids and really deserve a break," said Martha Corcoran, a former neighbor. "They're excellent people and have always worked hard. They've been under a lot of stress." 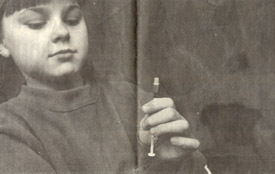 Helen Reid, 10, prepares to give herself a shot of an antigen which is similar to allergy shots. "Helen and Peggy's story is being repeated all over the country," said Deborah Altschuler of the National Pediculosis Association, which has compiled more than 700 cases of adverse reactions, most of them apparently caused by lice shampoos, lotions or sprays. "I think it is the biggest miss and mistake of contemporary medicine. Doctors are unfortunately prescribing this." Altschuler thinks a lice treatment a year before Helen's scabies treatment made her predisposed to medical problems. In Helen's case, it appeared one HMO doctor acknowledged she might have been poisoned, but his organization did not offer to pay for treatment. The problem is systemic, Haws charged. He said pharmaceutical companies and insurers simply aren't studying possible side effects enough. The Reids have hired a lawyer to explore legal action to claim damages, but that is tricky footing. The family clearly is the little guy in what appears to be a struggle against multiple Goliaths. Helen makes a pitiable David. Once a top student, she now gets just five hours of tutoring each week - isolated, of course, in a library - through the state. She does much of her suffering alone, or at least while feeling like she's alone. It's a terrible sentence for a kid who would rather be with friends bicycling or skating. Or, yes, even simply at school. Peggy and Bill Reid are at wit's as they try to help their 10-year-old daughter Helen get help for pesticide poisoning. One or the other is working virtually around the clock to help raise their seven children and heal Helen. They've even borrowed against their life insurance. But it's not enough. And after mixed signals, their HMO will not contribute to an approximate $20,000 payment needed for alternative medicine treatment in Dallas. This is too big," says Peggy Reid, Helen's mother. "We're hoping there's enough love in the world to make it happen."